Contrary to what is often said, James is not to be pitted against Paul, nor is Paul to be pitted against James, because they are not at odds. It is to be noticed that the only time we see the phrase "faith alone" in the Bible is in the book of James. However, while it is true this is the only place we see the explicit phrase used, it would be nonsense to limit the idea of "faith alone" to this one place. The entire purpose of Romans 3:27, 4:2-6, 9:10-11, 11:6, and Ephesians 2:9, for example, is that salvation is by faith without works: i.e. faith alone. There is a Protestant saying that has been around for a long time: "We are justified by faith alone, but faith is never alone". This saying explains how faith, not works, justifies us, while pointing to the obvious fact that faith always produces action. If it does not, this shows there is really no faith but only the untrue profession of faith. The action James is drawing our attention to is nothing more than the proof of faith, which, according to James, confirms the account of Genesis, that "Abraham believed God and it was counted unto him for righteousness." This justification took place before Abraham did any work at all, but his faith was later tested and proved to be real by his action. According to James, why was Abraham justified? Because he believed God (James 2:23). Yet by sacrificing his son Isaac, Abraham proved through this action that he believed God. Notice: he did not prove through his action that he was a good man, but that he believed God. His action, the necessary product of his faith, proved that he had faith in God's promise, that God would do what God said God would do, i.e. make a great nation through Isaac. Abraham proved that he really did believe God and therefore he was justified through faith alone, because his faith was real and was not alone. It can now be seen how James stands firmly with Paul and not against him. James is not against justification by faith alone, but is against untrue professions of faith that are alone (that is, without faith-proving action). On the other hand, Paul writes against the idea that God justifies us on account of our works rather than on account of faith alone. To be specific, Paul is against the idea that when God judges the world in righteousness God will proclaim righteous (justify) those who are by their actions righteous. Paul is against the idea that people, by doing righteous deeds, are thereby righteous and will on this account be justified. To put it another way, he is against the idea that to be declared morally acceptable by God a person must by their actions be morally acceptable. But according to the Bible, as well as our experience, everyone is in fact unrighteous and sinful by their actions. Abraham was no exception. He, too, was a sinner - that is, a bad person - who did not achieve moral acceptability by his behavior. Nevertheless, Abraham had faith in God's promise to him, which was given by God to him though he was a sinner, and he proved that he had real faith by his action. The most crucial thing to notice here - and the point that most people fail to notice - is that the action of Abraham which James draws our attention to was not action that showed he was a good person, but action that showed he believed God. Do you see the difference? James is not talking about good deeds that prove you are a good person, but action corresponding to your faith which proves that you believe. No one is good, and by works no one shows that they are good. We can only be justified through faith alone. But by our actions we can show that we believe. Consider Abraham's faith-proving action which James points to. It was not a good deed. It had nothing to do with the law, nor was it an action that we would consider moral and universally obligatory. Abraham's faith was tested by God when God told him to extinguish the very son that God had promised would be the means of making for Abraham a great nation. God promised Abraham one thing, and then told Abraham to do something that would naturally eliminate all hope of fulfillment! This was a test to see whether Abraham believed God would fulfill His promise, despite all appearances to the contrary. Abraham believed! The Scripture tells us that he went to sacrifice Isaac believing God was able to raise his son from the dead (Heb. 11:17-19). When God saw this, He knew, not that Abraham was a good person, but that Abraham believed. It was not a moral deed which proved his moral worth, but a deed of faith which proved his faith. James gives us a second example of justification through faith alone where faith is not alone. Who does he point to? None other than Rahab the prostitute! She, James tells us, was justified (James 2:25)! She was not justified (declared righteous) because she proved her righteousness by righteous doing. There is no mention of good deeds here. 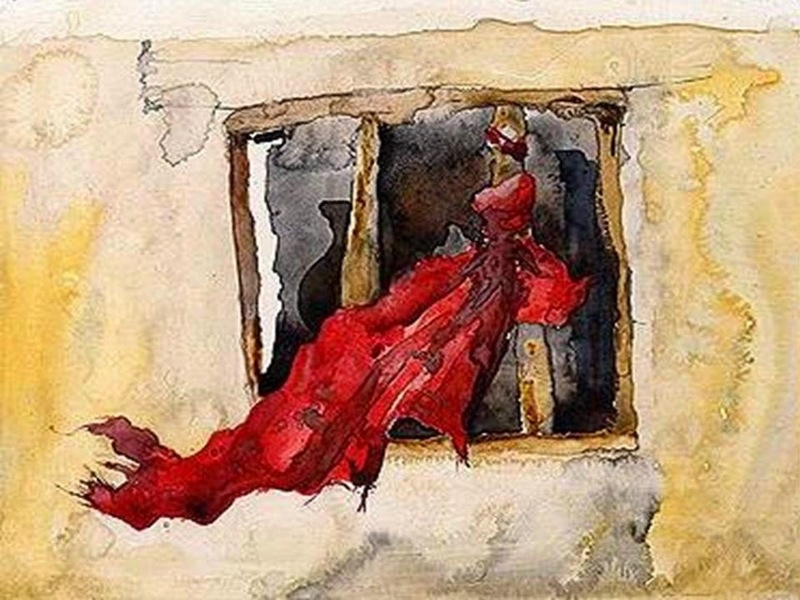 Rahab was a prostitute, and like everyone else in this world, she was not a good person. But like Abraham, Rahab had faith in God, and she proved that she had faith in God, not by performing any acts of righteousness, but by hiding the Israelite spies. That's all. She hid the spies, proving her faith was real and not an untrue profession, and therefore she was justified. It had nothing to do with being good. This is where Mormonism, Roman Catholicism, Eastern Orthodoxy and even many Protestants misunderstand James, because they think he is writing about good works rather than about faith-proving action. They think James is saying that we need both faith and moral behavior in order to be justified, or that moral behavior is what proves that we have faith and are righteous. It is because they misunderstand James that they create conflict between him and Paul. But, as the Scriptures tell us, God "justifies the ungodly", that is, the morally unacceptable, through faith alone (Rom. 4:5). Faith is never alone, for where there is real faith it is always proven by action. The two examples of Abraham and Rahab which James points to show us that this faith-proving action is not law-keeping or good works - not action that proves we are good people - but action that proves we believe. Thus this faith-proving action will be different depending on what our faith is. For Abraham, it was sacrificing Isaac. For Rahab, it was hiding the Israelite spies. For Christians, well, that's a topic for another article. The essential point to see in this article is: James is not talking about proving we are righteous by good works, but about proving we are believers by faith-proving action. James and Paul have always been in agreement. It is their readers who wrongly pit them against each other. Not so sure about this. James and Paul were not necessarily in agreement in Act 21:18-26. In fact, James implores Paul to prove he is following the law, so that the rumors about him negating the value of the law can be quashed. Paul then is instructed to make an offering at the temple. Later, Paul seems to explain this action in a rather two faced way by saying that "To the Jews I am a Jew and to the gentiles I am a gentile". Put all this together and it would seem very likely that James sought to correct Paul's focus on dispensing with the law. Were this not so, why would James have made such a big deal out of wanting Paul to show that he embraced and followed the law of Moses? Hi Anonymous, thanks for the question. Paul was never against the law per se. He stood against justification by the law. Had James been promoting justification by the law Paul would have confronted him, as he did Peter at Antioch when Peter inadvertently suggested justification was by the law (Galatians 2:11-21). Paul and James stood together at the Jerusalem Council in Acts 15. The reason Paul had no problem with going to the temple and performing the rituals that he did in Acts 21 was because these were not being done to secure justification with God. James and the Christians at Jerusalem were Jewish and believed it was right for them to preserve the Jewish lifestyle, but not as a means of justification. Paul could bear with this. There is freedom in Christ to do many things or to not do many things (see Romans 14). One person feels it is right to keep the Sabbath; another person feels they do not need to keep the Sabbath. One person cannot eat pork in good conscience; another person feels the liberty to eat all things. These differences are permissible. What isn't permissible is to think these issues concern justification. That is when you cross the line. So there is no conflict between Paul and James. The event you are pointing to had to do with issues of liberty in Christ, not justification. Paul would never have gone along with the Jerusalem Christians if what they were doing was a matter of justification. Thank for your thoughtful reply Eli. That said, it would seem you are using Paul to justify Paul here. "And when they heard it they began glorifying God; and they said to him, “You see, brother, how many [d]thousands there are among the Jews of those who have believed, and they are all zealous for the Law; 21 and they have been told about you, that you are teaching all the Jews who are among the Gentiles to forsake Moses, telling them not to circumcise their children nor to [e]walk according to the customs. 22 What, then, is to be done? They will certainly hear that you have come. 23 Therefore do this that we tell you. We have four men who [f]are under a vow; 24 take them and purify yourself along with them, and [g]pay their expenses so that they may shave their [h]heads; and all will know that there is nothing to the things which they have been told about you, but that you yourself also walk orderly, keeping the Law"
There it is in black and white. James wanted assurances that Paul walked "orderly, keeping the law." Just because Paul did not argue this point with James, but later argued with Peter, does not clarify this. Paul's argument with Peter came about because Peter was, in essence, being two faced. peter seemed to agree with Paul around the gentiles, when it came to circumcision, but would isolate himself from gentile practices when he was with the Jews. Paul simply called him out on playing both sides of the fence on the issues. That said, Paul and James are not involved in the same dynamic, as James is pretty clear about where he stands and what he expects. If anything, it seems that Paul is playing a game here. To explain this one cannot simply use Paul as his own witness either. It would seem that Paul needs an advocate from another passage of scripture, but that gets harder to find as one looks at the growing divide between Paul and the ideas of James. If I am wrong, one has to contend with the fact that James quote above makes his demands for Paul to follow the law very clear. Paul was also being asked to perform a purification offering. This was in fact a blood sacrifice of involving doves, if I am not mistaken. At the very least, according to modern Christian understandings, this would have made Paul guilty of a heretical act. Blood sacrifice is anthem according to Christian teaching. How could Paul have just gone along with this? Just look at James's words in Acts 21 carefully. There is no hint of a necessity to do those things for justification. James and the Jews believed that Jews should do those things, however, not to be saved, but because they were Jews and believed it was still right for Jews to practice in this way. Paul was more free in Christ than they were but respected the consciences of these men. When we say that something is not necessary for justification we are not saying anything about the rightness or wrongness of the thing. I believe loving my neighbor is right and that I should love my neighbor, but I do not believe loving my neighbor is a requirement for justification. So also James and the Jerusalem Christians believed keeping Jewish practices alive was the right thing to do. But they never suggest that these were required for justification. Paul would never have permitted them to think that. No, Christians wouldn't say that Paul committed a heretical act. Performing animal sacrifices were no longer necessary and required. But simply performing animal sacrifice is not heretical.